Over the past decades, CAD/CAM technology has achieved the best optimization of the process, obtained blocks made from different materials complying with aesthetic requirements, as well as biological principles. High strength characteristics of CAD/CAM chairside materials are associated primarily with the peculiarities of their microstructure. Modern materials are based on ceramics as structure with nanoscale crystalline grains and intergranular minimum intervals. Characteristics of structure, grain size and their packing density in large part set mechanical and strength properties of the materials. Modern dentists make a choice of material for CAD/CAM chairside restorations based on the knowledge gained from official information leaflets . Rather frequent is such situation when the indications of different (chemical composition and structure) materials are exactly the same (inlays, onlays, overlays, crowns, veneers). In such cases, the choice of material for clinical application is difficult without considering the peculiarities of physical-mechanical properties and structure of blocks for the CAD/CAM technology . PMMA material Telio CAD (Ivoclar Vivadent, Liechtenstein). Available information about the percentage of oxide compounds in blocks of feldspatic ceramics were: SiO2 - 56-64%, Al2O3 - 20-23%, Na2O - 6-9%, K2O - 6-8%, CaO - 0,3-0, 6%, TiO2 - 0,0-0,1%. Leucite glass-ceramic blocks consist of SiO2, Al2O3, K2O, Na2O, CaO and other oxides and pigments. Blocks of hybrid ceramics have 86% of feldspatic ceramics and 14% of polymer component. The structure of this material is an interpenetrating ceramic and polymer matrix. The ceramic structure hybrid ceramics is: SiO2 - 58-63%, Al2O3 - 20-23%, Na2O6 -11%, K2O4 - 6%, B2O3 - 0.5-2%, CaO - <1%, TiO2 - <1% and others. Polymer blocks contain 98% of polymethylmethacrylate and approximately 1% of pigments. Samples of materials were made in the form of plates (size 15х5х3 mm) with plane-parallel sides. The samples were alternately fixed on the object table placed in the cup with distilled water (27 ̊C) and were studied using the acoustic microscope SIAM-2, developed at the Institute of biochemical physics at Moscow (Russia) [3, 4]. When probing for sample, ultrasonic pulses pass through the immersion liquid, reflect from the front surface of the sample, the elements of the internal structure and the bottom of the sample. The reflected signal consists of signals separated by intervals which are determined by the propagation time of the probing beam from one obstacle to another. These time differences allow to select the signals received at different depths in the sample volume and build the bitmap of one-dimensional (B-scans) and two-dimensional (C-scans) acoustic images of the internal microstructure. Studies on samples were performed with acoustic lens having a working frequency of 100 MHz and an aperture of 11°. We analyzed oscillograms (A-scans), images of the internal structure of samples obtained in the form of transverse vertical slices (B-scans) and the images of the internal structure with a predetermined thickness at a predetermined depth in the sample (C-scans) (Fig. 1). c) Two-dimensional acoustic image (C-scan), the structure of the image corresponds to a layer in the sample, its position and thickness are shown in A and B-scans. Time delay between pulses reflected from the top and bottom surfaces were defined by the local values of velocity of longitudinal and transverse waves. On the oscillograms by the time delay, the signal was determined reflected from the lower boundary of the sample and formed during the passage of a longitudinal wave through the volume of material; and signal generated by the conversion of the sound modes when passing through the volume of material. The resulting time of propagation of the longitudinal and transverse waves in conjunction with the known thickness of the material allowed us to determine the velocity of longitudinal CL and transverse CT sound waves in the material. The density ρ of the materials was obtained by the method of hydrostatic weighing by the balance KERN Alt 220. - ρ - density of the material, g/cm3. - G - the shear module of elasticity, GPa. On the oscillograms (A-scans), time delays of signals due to the passage of longitudinal waves and conversion of longitudinal and transverse waves were determined. Results of the calculated speed of propagation of longitudinal and transverse ultrasonic waves inside materials are shown in Tables 1, 2 present the results of calculating the density of materials. Table 3 presents the results of the calculation of the elastic modules: bulk module, shear module, Young's module and Poisson's ratio. Ceramic materials characterized by high, (in comparison with other research materials) values of shear modules and modules of compression, have high stiffness (E = 70 GPa) and low plastic properties (µ = 0,19), which determine the propensity of this type of material to brittle fracture. Table 1. The speed of propagation of longitudinal (CL) and shear (CT) waves in the samples of dental materials. Table 2. The density (ρ) of dental materials. Table 3. The value of bulk (K) and shear (G) modules of elasticity of the material, Young's modulus (E) and Poisson's ratio (µ). The polymer group of materials has the lowest values of modules of elasticity, so respectively is subjected to deformation and fracture under low loads. Plastic properties of hybrid ceramic (due to its dual internal structure) are best compared to leucite glass ceramic properties, but the strength characteristics of hybrid ceramic are lower in 1.5 times. The obtained results must be considered in the clinical dental practice in the choice of materials for the manufacturing of dental crowns with different wall thicknesses. When a thin-walled permanent dentures, ceramic and hybrid CAD/CAM blocks should preferably be used. It is possible that high values of deformation of polymeric crowns under the functional loads due to the low elastic modulus of these materials cause partial and full recementation and “edge permeability” at the borders of hard tissue of teeth and thin walls of polymer dentures. Analysis of the internal microstructure of the samples was performed under the same preset scan settings (amplification of the ultrasonic signal, the scan step etc). Bitmap construction of acoustic images showed the brightness point in the image depending on the amplitude of the reflected signal at the same point. Fig. (2) shows acoustic images of the internal structure of the samples (scans). The structure of the samples displays a depth of 0.8 mm from the surface and the thickness of the layer images - 50 µm. Bright dots in the images correspond to the pores in the volume of the samples. Most of them were observed in the volume of feldspatic ceramic and glass ceramic materials, the size of which varies from a few microns to hundred of microns. 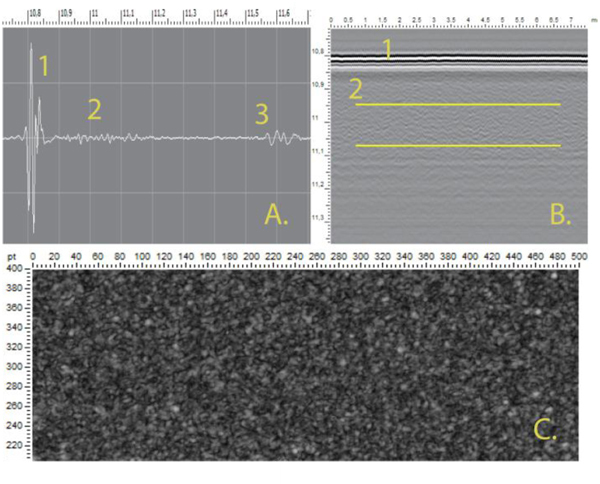 In the volume of the hybrid ceramic uniform, two-phase structure (ceramic and polymer) was observed. Variation of dark and gray areas in the image corresponds to the amplitudes of the reflection on the border of two phases in the material volume. The volume of the polymeric material demonstrates a homogeneous structure (dark background) with a low content of pores and air inclusions (bright spots on image). Thus, we found that the volume of blocks (obtained by pressing) from ceramic materials had pores with the size significantly exceeding the dimensions of the crystalline grains and the spaces between them, exceeding the common size of dentures precision (50 microns) (Fig. 3). Such defects can create points of retention of dyes and microorganisms, and therefore, influence the longevity of restoration. In recent years, CAD/CAM technology reached the greatest development with the method called “chairside”. The advantages of this method/technique over the labside technique are: time saving process, patient's involvement in the process of making restoration and the need of a dental laboratory [3-5]. Often different dental materials have the same indications for use. Despite the relevance of this topic, there is lack of necessary information in academic literature about the peculiarities of application of different chairside materials in dentistry. We conducted a study on the scientific literature contributed by domestic and foreign authors and identified the fragmented nature of research on this topic. To study one of the most important parameters of the dental CAD/CAM materials (microstructure), we decided to use а scanning impulse acoustic microscopy. With the method of Scanning Impulse Acoustic Microscopy (SIAM), we studied 3 groups of CAD/CAM chairside materials and detected differences in the structure of blocs of ceramic, hybrid ceramic and polymeric materials for CAD/CAM technology [6-10]. We obtained acoustic images of internal structures of CAD/CAM chairside materials which were studied for their elastic properties. We proved that the materials used for the solution of similar clinical tasks are fundamentally different in their elastic characteristics: from soft (flexible) polymeric materials to hard (prone to brittle fracture) ceramic materials [11, 12]. 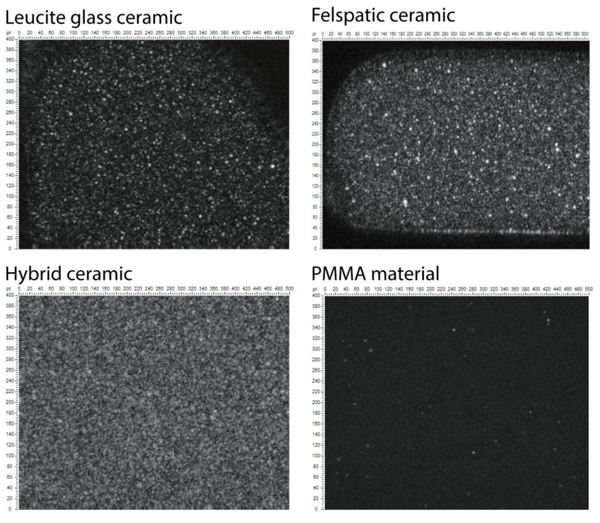 Study of the internal microstructure of the CAD/CAM chairside materials showed the presence of fine-pored structure inside leucite glass ceramic samples and feldspatic ceramic samples. The size of the largest of them was measured using software of the microscope. The maximum detected pore size in leucite glass ceramic samples was 70±15 µm. The maximum detected pore size in feldspatic ceramic samples was 100±15 µm [6, 12-16]. Therefore, the size of pores in ceramic ranged from 10 to 100 microns. In the volume of polymer materials, isolated point defects of internal structure were found. In the structure of hybrid material, defects were not detected. Our results indicate the possibility of the presence of relatively large pores (up to 100 microns) as surface defects on ceramic crowns made by CAD/CAM chairside technology. CAD/CAM chairside technology requires full refuse of dental laboratory during the process of dental treatment; the final step of producing crown is only polishing [6, 12-16]. But mechanical polishing cannot polish out surface defects (from 10 to 100 microns) without a significant change in the shape and the size of the crown. Apparently, in cases of chairside production of dental crowns, it is necessary to give preference to the blocks of hybrid ceramics. Such ceramics devoid of quite large porosity, glazing for CAD/CAM crowns made from leucite glass-ceramic and feldspatic ceramic may be an option. For these purposes, commercially available special muffle furnace for clinical and laboratory individualization and glazing of ceramic prostheses were provided. Such equipment even more increases the cost of manufacturing of CAD/CAM chairside ceramic crowns compared to using blocks of hybrid ceramics for the same goals [12-16]. No Ethics approval was needed for this research article. No Animals/Humans were used in this study. Alao AR, Stoll R, Song XF, et al. Fracture, roughness and phase transformation in CAD/CAM milling and subsequent surface treatments of lithium metasilicate/disilicate glass-ceramics. J Mech Behav Biomed Mater 2017; 74: 251-60. Batson ER, Cooper LF, Duqum I, Mendonça G. Clinical outcomes of three different crown systems with CAD/CAM technology. J Prosthet Dent 2014; 112(4): 770-7. Baltzer A. All-ceramic single-tooth restorations: Choosing the material to match the preparation: Preparing the tooth to match the material. Int J Comput Dent 2008; 11(3-4): 241-56. Belli R, Wendler M, de Ligny D, et al. Chairside CAD/CAM materials. Part 1: Measurement of elastic constants and microstructural characterization. Dent Mater 2017; 33(1): 84-98. Berezina S, Blank VV, Levin VV, Prokhorov VV. Observation of ultrasound velocity gradient in fullerene ceramics by acoustic microscopy. Ultrasonics 2000; 38(1-8): 327-30. Denisova LA, Maev RG, Poyurovskaya IY, et al. The use of acoustic microscopy to study the mechanical properties of glass-ionomer cement. Dent Mater 2004; 20(4): 358-63. El Zhawi H, Kaizer MR, Chughtai A, Moraes RR, Zhang Y. Polymer infiltrated ceramic network structures for resistance to fatigue fracture and wear. Dental Mater 2016; 32(11): 1352-61. Goryainova KE, Morokov ES, Retinskaya MV, Lebedenko IJ. Elastic properties and porosity of dental blocks made from non-metal materials used for chairside CAD/CAM crowns. Stomatologiia (Mosk) 2017; 96(2): 55-8. Homaei E, Farhangdoost K, Tsoi JKH, Matinlinna JP, Pow EHN. Static and fatigue mechanical behavior of three dental CAD/CAM ceramics. J Mech Behav Biomed Mater 2016; 59(2): 304-13. Kinoshita A, Senda S, Mizushige K, et al. Evaluation of acoustic properties of the live human smooth-muscle cell using scanning acoustic microscopy. Ultrasound Med Biol 1998; 24(9): 1397-405. Makhija SK, Lawson NC, Gilbert GH, et al. Dentist material selection for single-unit crowns: Findings from the national dental practice-based research network. J Dent 2016; 55: 40-7. McCracken MS, Louis DR, Litaker MS, et al. Treatment recommendations for single-unit crowns: Findings from the national dental practice-based research network. J Am Dent Assoc 2016; 147(11): 882-90. Molla AR, Basu B. Microstructure, mechanical, and in vitro properties of mica glass-ceramics with varying fluorine content. J Mater Sci Mater Med 2009; 20(4): 869-2. Mota EG, Smidt LN, Fracasso LM, Burnett LH Jr, Spohr AM. The effect of milling and postmilling procedures on the surface roughness of CAD/CAM materials. J Esthet Restor Dent 2017; 29(6): 450-8. Ramos Nde C, Campos TM, Paz IS, et al. Microstructure characterization and SCG of newly engineered dental ceramics. Dental Mater 2016; 32(7): 870-78. Wendler M, Belli R, Petschelt A, et al. Chairside CAD/CAM materials. Part 2: Flexural strength testing. Dent Mater 2017; 33(1): 99-109.